Operating System: Proprietary operating system, spreadsheet, communications including terminal emulation. ROM templates for calendar, memo pad and phone list. 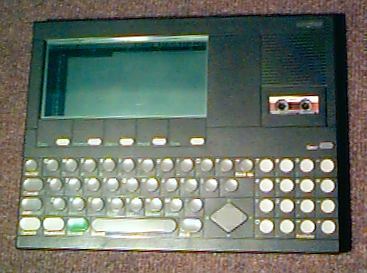 The WorkSlate is a very unusual machine which uses a spreadsheet metaphor. It can also act as an answering machine! While it was contemporary to the TRS-80 Model 100, it was half the thickness and used NiCad batteries. A battery-powered portable hard copy plotter was optional. If you look closely at the photo, you can see the Lotus 1-2-3 style spreadsheet interface in action.